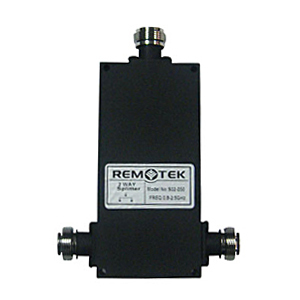 Remotek provides splitters that split or combine RF power. According to the coverage requirement, splitter can distribute RF power into several paths to achieve coverage of each area while mobile signals from different coverage areas are combined together through the splitters and transmitted into the repeater. Remotek Wilkinson splitters are designed for low insertion loss and compact in size, which are utilized to equally split signals into in-phase signals as found in balanced signal chains. On the contrary, they can also be used to combine signals while providing excellent isolation between the individual signal sources. Remotek line of high power capable 200 watts cavity splitters covering all wireless frequencies from 800 to 2500 MHz. Available in 2-way, 3-way and 4-way configurations fitted with N-Female connectors. This cavity RF splitter series provides a low loss, equal power split at all output ports while maintaining excellent amplitude and phase balance.